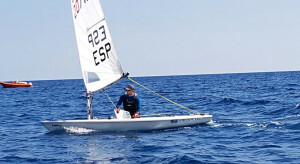 Today we mention a young athlete of our people, Guillermo Flores, sailor belonging to the Yacht Club Rio Piedras and has returned to active competition in the Laser class, after overcoming a serious injury after having undergone surgery that has kept him away many months for recovery. A more than creditable 16th place achieved Guillermo In the Laser class 42ª Christmas Race which it was held these days in Palamos.For Flores This was a very important test after months of training and tuning after undergoing surgery, That's why so for him It was more a test than anything else. This traditional international regatta for Olympic classes and youth World Sailing (International Sailing Federation) meeting about 350 boats and more than 600 regatistas. Guillermo Flores ended very satisfied with what has been done, and as he pointed to the website of the Andalusian Sailing Federation, I was "Happy with how I felt",He is arguing that "the result might not reflect much but if you have not been above has been for silly details that have not allowed me to look more". Flores acknowledged he felt very good physically: "I've seen strong, It has been a tough race, stockings 25 knots, and I put up very well, I have seen the work I have done in recent months has been more than satisfactory ". Flores concluded: "I bring, further, many things to keep working hard facing the goal is the Sophia of Palma, so I'll get on it right away. We hope to see you soon for our waters and fit Rompido. !! Much encouragement, Guillermo… ! !